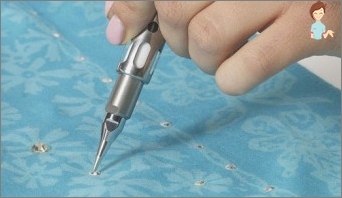 How to paste rhinestones on clothes, glass, leather, shoes? 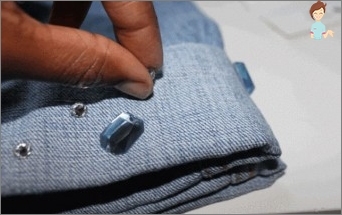 How and how to paste rhinestones on clothes: a detailed description of each method. How to decorate with glass glasses? How to glue crystals to shoes? Rhinestones - an imitation of precious stones,Which is customary to decorate clothes, shoes, accessories, interior items. Clothes, decorated with crystals, are especially advantageous in the brilliance of spotlights and spotlights. But little by little the rhinestones from the world of show business, where they were used at first, went to everyday clothes. It is beautiful and fashionable, but, unfortunately, and expensive,So knowing how to properly paste the rhinestones on clothes will come in handy for any fashionista. Having learned this simple craft, you will be able to diversify your wardrobe, emphasize the texture and color of the fabric, to give along the shine and zest. How and how to paste the rhinestones on the fabric? Before proceeding to the process itself, at firstCalculate the number of required stones. Draw a picture on the fabric and, taking into account the density of sewing and the size of the crystals, count how much you will need jewelry. Buy with a margin. When buying, pay attention to the price, tooCheap rhinestones after gluing can lose their brilliant appearance, and only spoil the clothes, and not decorate. So buy quality jewelry. When gluing the crystals, work carefully, because if the stone is stuck incorrectly, it is unlikely to remove the traces of glue. The best way is to apply glueDirectly on the fabric itself, and not on the stone. To do this, lay the fabric on a special substrate, which it will not stick to during the gluing process, since the glue will necessarily percolate through the material. Apply to the outline of the pattern from five to ten drops of glue, and with the help of a sharpened church candle, transfer the pebbles to the glue. When the crystal takes its place, a littlePress and hold, until from under it will act a little glue. Decorated with stones details of clothes are dried in a straightened form. The drying time for each glue is different. Some types of crystals are already inherentlyAre sold on an adhesive basis. They are called thermostrases because of the way they are glued. How to paste such crystals - for this you need to take an iron. The glue melts under the influence of temperature and the stone firmly adheres to the fabric. To practice, try to paste your first pebble on an unnecessary piece of cloth. Also note that it is easier to glue the thermosetting parts of clothes, than to the finished product. Remove the iron and let the things cool down. Not every material can be gluedThermostrase with iron. Some fabrics and materials such as velvet, suede or leather iron are contraindicated. In this case, you can use a special applicator. This is a small device similar to a soldering iron, with a set of special baits - the size of pebbles, which only heatpoints point heat. Before you start, screw the right attachment,Focusing on the size of the thermostrase, then spreading the crystals along the contours of the pattern, apply the device to each pebble in order until the glue does not grasp. The retention time of the applicator, as in other cases, depends on the size of the thermostrase. When you need to paste large sections of pastesFabric, it is best to use a tape of Scotch tape. In the beginning, the pebbles are transferred to the film with a faceted side, then the film is transferred to the product, and everything is ironed by iron. The downside of this method is that you can not control the gluing of each pebble, but if you need to process a large amount, then the method is irreplaceable in speed. After gluing, the film is removed. How to paste crystals on a glass glass? As already mentioned, rhinestones decorate not onlyClothes, but also things from household use. It is especially popular to decorate with stones stones for weddings and other celebrations. The method of gluing depends on the type of crystals - there is a cold fixation, and there are thermostrases already familiar to us. Therefore, choosing what to glue rhinestones-pebbles on the glass, consider their type. The thermostrases are more designed for tissue. In order to decorate the glass, it is better to take pebbles of cold fixation. It is easy to glue them, since they have a flat bottom. Glue is better to take building, on a transparent basis. You can use "liquid Nails". The technology here is slightly different from the one thatWe used when gluing the fabric, since the glue is applied directly to the crystal, and then only the pebble is glued to the glass. The drying time depends on the glue. How to safely paste rhinestones on shoes? Strasses can decorate any shoes - not only concert shoes, but also casual shoes, flip flops, leather and suede boots, even slippers. Thermostats for this also do not fit, thereforeBuy ordinary pebbles, without glue base. But before you go to the store, decide on the design, apply a wax crayon pattern on the shoes. After all, in addition to crystals, you can use shines and other types of decoration to decorate shoes. In order for the crystals to adhere well toShoes, buy special glue. If the shoes are leather, then before you start to paste the rhinestones on the skin, first it needs to be degreased with alcohol or a soapy solution. Otherwise, the glue can simply slip off the desired spot or the pebble will stick very weakly and bounce off during operation. After the skin is degreased and the pattern is applied, drip a drop of glue onto the crystal and press it against the shoes. Hold it a little. 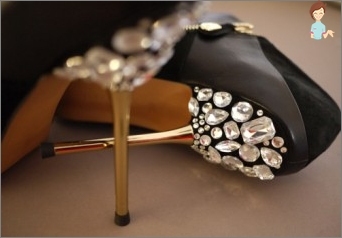 Shoes with crystals are worn cautiously, and in the washing machine is not erased. As you can see, there is nothing difficult in Decorate clothes, Shoes or accessories rhinestones. The main desire, creative imagination and patience, and your things will acquire their individual person!